Please allow me to use this review to reflect on some of MetalReviews.com site history. 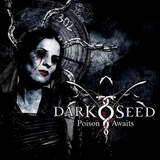 For whatever reason Darkseed Diving into Darkness appears as the first review ever entered into the site’s backstage database and it was posted soon thereafter in March 2000. I was not with MetalReviews at the time and only started following the site a couple of years later, and joined the staff some time at the end of the summer of 2002. For over 10 years now, due to the blood, sweat and tears of the site’s founders and many writers who came after, MetalReviews has been trying to shed light on extreme music. How successful did we manage to be? I’d leave that to the reading public to decide, but here is hope to 10 more years. Back to Darkseed now. Even though that first review in MetalReviews.com database was pretty glowing I remember being disappointed with the direction the German band took at the time. Spellcraft had moxie in its doomy/death rocking approach, while Diving into Darkness was borrowing gloriously from the gothic days of Paradise Lost and Depeche Mode. The album was pompous, but not very memorable. As a result, I lost interest and didn’t even know the Germans continued for a few more albums after that. 2010 Poison Awaits comes after five years hiatus, caused by who knows what, with only one or two original members remaining and vocalist Stefan Hertrich long gone. Although, whether he would have been present on Poison Awaits is irrelevant as the days of Spellcraft were irretrievably lost over 10 years ago even with him in the mix. Harald Winkler now mans the mic, with a pair of guitarists connecting Darkseed to its earlier incarnation. Musically speaking, Poison Awaits is still gothic metal, being made pretty dark and heavy, but mostly through production. It is as if Darkseed circa 2010 is gothic on the eve of their performance, rather than in lifestyle. On the other hand, the album is quite a bit less pompous than I remember Diving into Darkness to be. Full of friendly gothic chug from European rave party (Incinerate) and muddied, roughed up guitars of the latter days Sentenced (title track), the band does make a pass towards more grounded, personal and emotional approach. As a gothic album, I can’t say I don’t like Poison Awaits. It is quite varied, melodic, with driving catchy songs. Darkseed are experienced musicians and can go on twisted lengthy keys (Incinerate) or guitar (A Dual Pact) runs, but those are contained within a fabric of a song. Harald Winkler makes his voice fit the music, following the melody curves, especially in softer tracks (Seeds of Sorrow). Aided by multiple overlapping vocal lines, the singing on Poison Awaits is on par with the rest of the fray, which reminds of Finnish gothic rock bands in places (To Die For) or what Evereve was doing after they left melodic death metal. Whenever Poison Awaits departed what I felt was its comfort zone, it immediately had my eyebrows raised as well. The slight industrial elements in Roads are simply to make things a little darker, but metalcore growling towards the album’s end on No Promise in the Heavens and Striving for Fire seem totally out of place. Why so late and why now? The somber track Timeless Skies brings back the pompousness of Diving into Darkness, just when you thought Darkseed is going to be gothic on a more personal level from now on. I suppose if you were a fan of the band you don’t need my musings here to jump on Poison Awaits seeing that the band has been dormant for so long. For other gothic rock/metal lovers this is a safe purchase as well. A wonderful gothic metal album of 2010, however, it is most certainly not, but I have had a few songs on repeat for a couple of days.